With the arrival of the new year, many of us will spend our time organizing papers in anticipation of a happy tax refund. In order to claim that reimbursement, we will probably need to have all of our receipts in order. A quiet place to sift through papers and files undisturbed is essentail to this task. Some people are lucky enough to have a separate home office for this kind of work. Others rely on a desk in a corner of the kitchen. Kitchen desks are not ideal, however, because they are neither quiet nor secluded and often end up as a catch-all location to dump things, making it difficult to keep papers and files out in the open for several weeks while you are working on them. However, even if you live in a full house, you can find space to create a quiet and private office nook away from houshold chaos in your closet. Built in closet desks take several forms ranging from the complete closet to home office conversion, to dual function spaces where a built in desk is added inside an otherwise traditional closet. 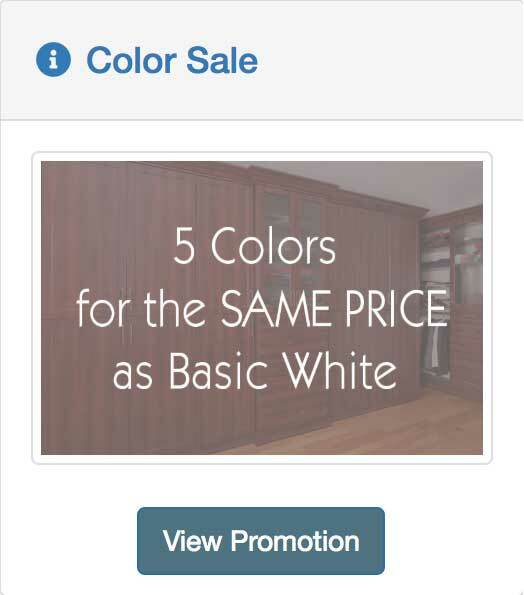 They run the gamut in size and can be configured for either walk-in or reach-in (wall) closets. Whether you are planning a closet to office conversion or giving your space dual functionality with a built in closet desk, desks in closets offer surprising advantages. Sometimes two or more problems can be eliminated with one solution. 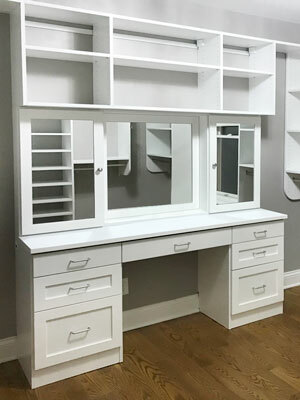 If you hestitate to try adding a desk to your closet because you are short on storage space as it is, or if you are afraid of giving up any clothing storage for a desk, this could be the answer to your problems. Your spare bedroom/den can be converted into a multipurpose space that includes both increased closet storage and a private office nook, while retaining the original guest room/den functionality. 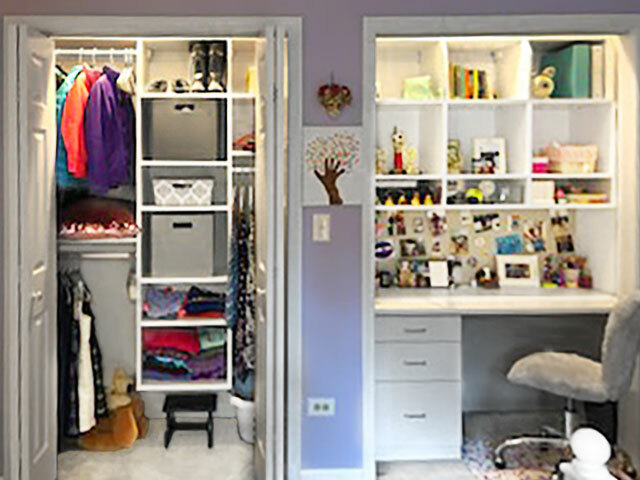 To achieve this, add closet storage along a wall of the spare bedroom/den. It can be enclosed behind doors as a wardrobe closet for a custom armoire look, or left open if you are relatively neat about the way you hang things. 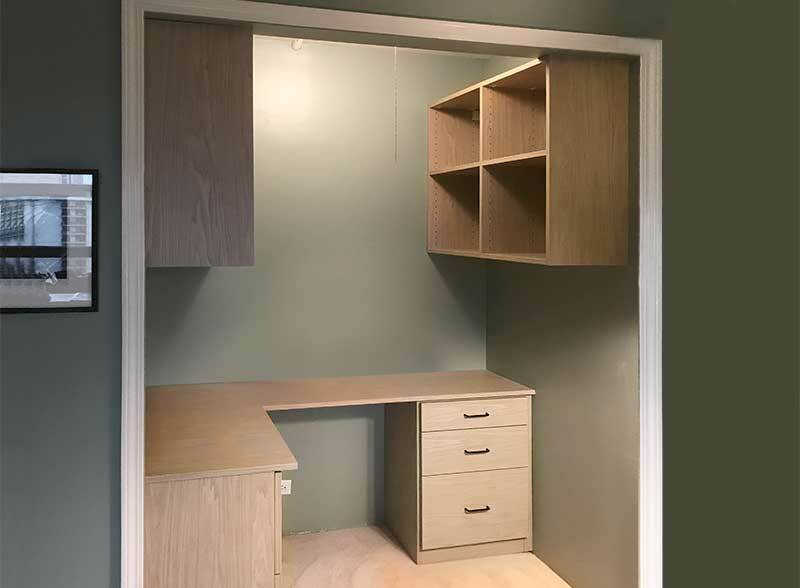 This will free up the original reach-in closet in the room, making it the perfect candidate for a closet to office conversion through the implementation of a built in closet desk. To begin your closet renovation, remove the doors and any rods or shelves. A desk countertop should be installed that stretches completely across the previous closet space. An "L" shaped speed brace shoud be anchored to the wall studs every 36 inches to support the full weight of the countertop. The return wall on the closet can be removed or not — it is totally optional. (A return wall is the small section of wall along the front of the closet that frames the doors). Removing the return walls allows for more leg room and space for file drawers under the desk and cabinets above. Whether you remove the return walls or not, the end result is an attractive office nook. This plan keeps two of the original bedroom walls untouched, acccommodating any windows and doors in the room. Furnish this space with a custom closet island, sofa, Murphy Bed, or any combination of these depending on your needs to provide greatest functionality of the new multipurpose space. Workplace trends mean that many people now work, at least part of the time, from home rather than a corporate office. Zero commute time is an obvious benefit, in addition to the less tangible benefits of a happier workforce. If you are one of the lucky ones who can conduct business from home at least one day a week, it is nice to have a dedicated space for work that is separate from your home/leisure areas. 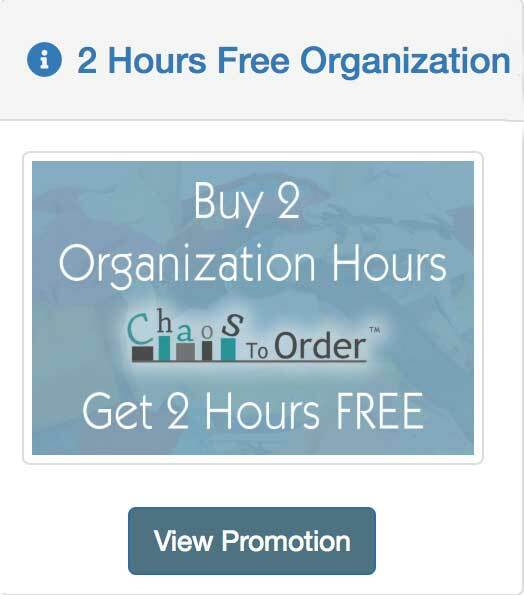 Having this separation can help eliminate distractions while you are trying to concentrate on work activities. It also provides a physical space where you can leave your work problems behind while tending to family and friends. The space doesn't need to be large. The cubicles offered at most companies aren't very big. It's relatively easy to create a home office that meets or excedes your company cubicle. 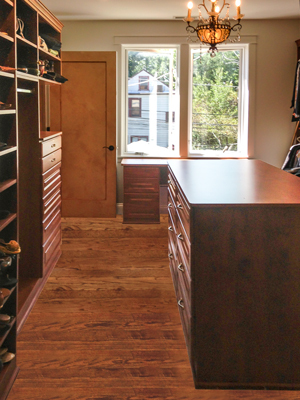 A spare closet that isn't needed for clothing storage can be transformed into a perfect home office. Whether you have a small walk-in closet or a reach-in closet, the space can be reconfigured into a highly productive and comfortable work center. Using many of the same tips outlined above, install a desktop that is at least 48 inches wide into the previous closet space. If it is to be your main work station, this is the minimum width to maintain comfort. Allow 36 inches behind your chair so that you can move comfortably at your desk. The 36 inches can include space outside the closet if you are working with a reach-in or wall closet. If yoy are planning an "L" shaped or corner desk, the side adjacent to the main desktop must at least 15 inches wide. 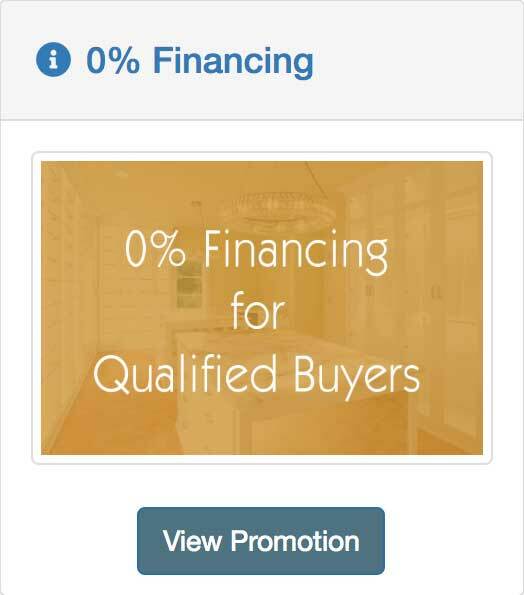 Generally, bigger is better, but these are the minimums. A closet to office conversion like this will create a small office nook with more privacy and space than the average corporate cubicle. Most closets are only used in the morning when getting ready to start your day, and in the evening when winding down before bed. 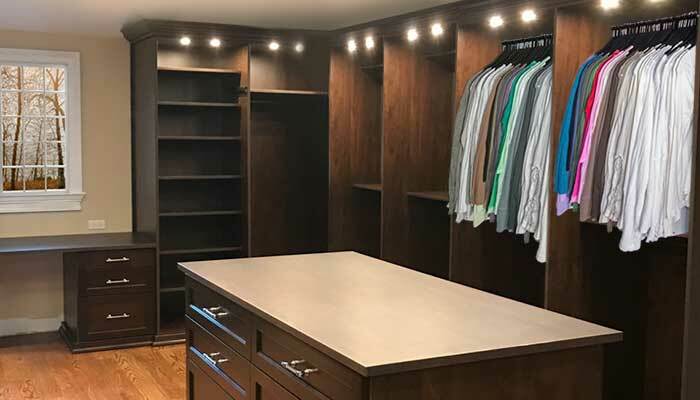 If your closet is relatively spacious, you can improve the usability of the space and increase the amount of time you spend in it by including a desk in your closet design. At first, the idea of putting a desk in your closet may seem a bit odd. However, when you think about it, the closet is usually a quiet, distraction free area. Children rarely ask to play in their parent's closets. The space remains undisturbed for the most part. It's not a social space where friends might drop by. All the hanging clothes provide a lot of sound dampening insulation. When you think about it in that light, the closet is the perfect place to locate your home office. If you already have a vanity table in your closet/dressing room, repurposing it as a desk for work is a simple task. If you don't have a vanity table, locate your new closet desk in any unused horizontal space that is at least 48 inches wide. You can easily create the needed horizontal space by consolidating your existing hanging areas with double hang closet organizers. If your closet has a window where you can position the desk, that is even better. Built in desks are able to put every inch of space to best advantage due to their custom dimensions, however, any desk that will fit the space will do. Even homes that don't have a lot of extra space can offer a calm office nook away from household chaos when you consider the existing closet as a possible location. Why not take advantage of the already quiet solitude offered inside your closet? 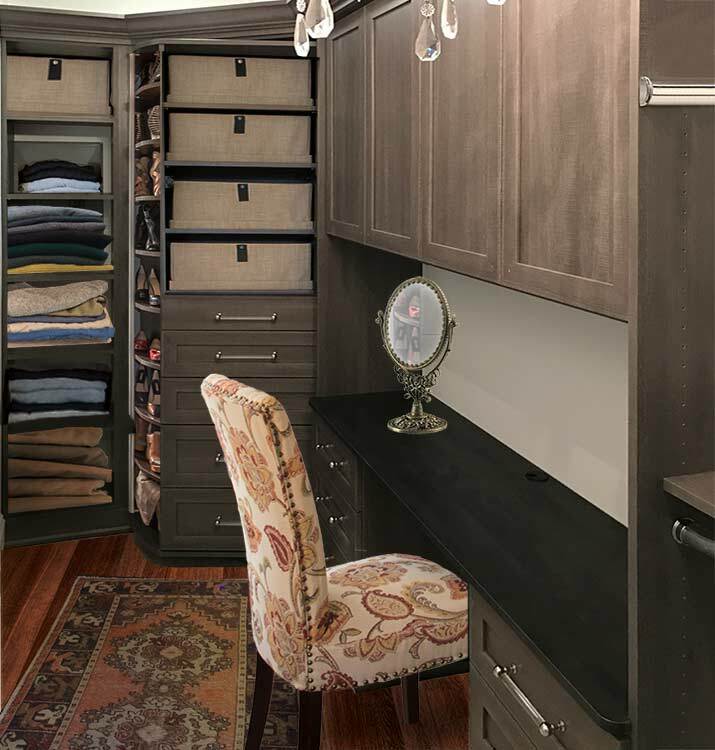 The idea of having a desk or home office inside your closet can strike some people as a bit unusual at first, but the efficiency and practicality offered by a closet office outweighs any oddities in the arrangement. Closets make great home offices. All it takes is a little planning and organization to make your own closet into a quiet and productive work space.